Regular use colored polishes can lead to nail discoloration. Blame the bright pigments that eats into the nail plate, and formaldehyde, changing the color of the nails. Often for masking yellowness women again use nail Polish. It is a vicious circle. If you are sure that your nails turned yellow because of frequent colorations, not health problems, then lead them to form their own. Good whitening effect, it also has lemon. The easiest way: cut the fruit in half and insert the halves into his nails. Sit there for 5-10 minutes. You can cut the lemon and RUB the nails 3-4 times a day, and you can squeeze the juice, add the olive oil and do bath. As a result of this procedure, the nails will not only be lighter but also stronger. Daisy combines a bleaching and disinfecting effect. Pour 2 tablespoons of dried flowers in a Cup of boiling water and let them steep for half an hour. After that, the resulting dilute broth with warm water in an amount of 0.5 liters and put in his hands for 20 minutes. Carry out this procedure 2-3 times a week. The bath of sea salt will make your nails brighter and stronger. Dissolve in warm water 2 teaspoons of salt. If you want you can add essential oils of grapefruit, tea tree, sandalwood and bergamot. Put your hands in the solution for 10 minutes and arrange a second appointment in 2-3 days. Buy at the pharmacy grapefruit seed extract. Take a small container, mix it with 5 drops of this extract and a tablespoon of olive or sunflower oil. Lubricate the nails received by means 3-4 times a day. Hydrogen peroxide is also known for its bleaching properties. Add it in the amount of one tablespoon to 2 tablespoons of baking soda and mix well. The result is foaming you'll have a paste that should be applied to the nails and leave for no more than 5 minutes. This method is one of the most quick acting and in the same time aggressive, so its use is recommended only in cases of emergency. For those who don't want to cook chickpeas on their own, cosmetic industry invented special products such actions. They can be produced in the form of gel, oil or serum in a bottle for nail Polish. The action of such funds is based on the peeling of the top layer of the nail plate, so owners of thin nails should use them with extreme caution. There are also special tablets that contain citric acid, extracts of rosemary and chamomile. They must be diluted in water. On the shelves you can meet and bleaching pencils that are used to make the nail tip's white color. Sometimes the nails lose their natural color and turn yellow or covered with yellow spots. This can be caused by too frequent application of nail Polish, Smoking, alcohol consumption or too intense exposure to UV rays. To whiten your nails and return them to a healthy appearance will help folk remedies. Cut in half fresh lemon and dip your fingers in both halves. Keep the nails in the flesh of a lemon a while or wipe them with fresh lemon juice. Mix a small amount of lemon juice and a few drops of olive oil. Wipe nails the mixture – it will bleach them and simultaneously moisturize. Another recipe masks for whitening and nail treatment includes lemon juice, a teaspoon of essential oil of jojoba and a few drops of oil of ylang-ylang. 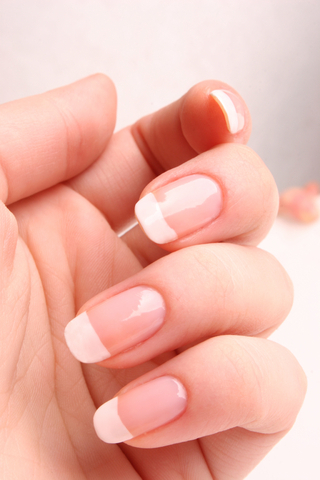 Apply nail mask with a cotton swab after some time rinse. To whiten nails do the nourishing bath decoction of chamomile. Chamomile pour boiling water, leave for half an hour, cool and pour into a container for vennochi. Lower the arms back for 15 minutes and repeat a couple of times a week. Combine chamomile baths with masks and rubbing lemon juice will enhance the effect. Also trays can be made from sea salt, a few teaspoons of which should be diluted in water, and if desired, add lemon juice. Dip fingers into the tub for 10-15 minutes. Do the bath for two to three weeks. If you have rose water, mix it with glycerin and three-percent hydrogen peroxide. Apply on the nails the resulting mask with a cotton swab. Mix baking soda and hydrogen peroxide. Stir the mixture to make a thick paste. Apply it on nails, after 3 minutes rinse with warm water. In addition, the peroxide may be mixed with glycerine where glycerine – 1 part peroxide and 5 parts, and use the same as the previous mask. Also you can use numerous professional cosmetic tool for whitening nails. It is always nice when marigolds look nice and neat, have a healthy glow. And this, of course, you need to care for them. Often, however, even with proper care, the nails turn yellow. Currently, there are many different funds that help to cope with this defect. Before you begin to whiten your nails, you first need to understand the reasons for their yellowness. The first reason is Smoking. Exit here alone - to quit this bad habit. The second reason is the use of low - quality varnishes. Many varnishes are composed of a substance such as formaldehyde. From such funds should be abandoned. The third reason is problems with internal organs such as the liver, kidneys. In this case, you must consult a doctor to be examined. The fourth reason is fungus. 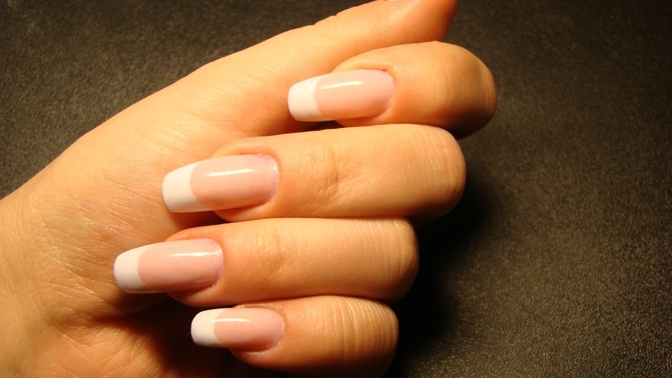 After will cause the yellowness of the nails and fixed, you can proceed directly to the bleaching of nails. Well-proven lemon juice in whitening the nails. Need daily for two to three weeks to wipe each nail with lemon juice mixed with olive oil (the proportions are taken one-to-one). This procedure will not only make the nails much whiter, but also visibly stronger. Another great tool - soda baths. You need a tablespoon of baking soda, pour a glass of warm water, and stir everything well and keep your hands in water for about 15-20 minutes. The result of the whitening is noticeable after the third or fourth procedure. If the nails need to bleach one day, in this case, can help mask on the basis of hydrogen peroxide and baking soda. So, in a bowl, mix two tablespoons of baking soda and one tablespoon hydrogen peroxide and apply paste on your nails for five minutes to seven, then remove the product with water with lemon juice (per Cup of water teaspoon of juice).